Follow our guidelines to assure a perfectly cooked burger. What if i like my steak done more than medium-rare? 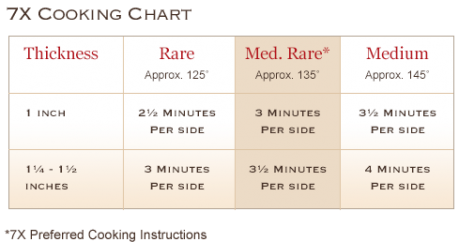 You’ll still have an amazing steak experience, but cooking beyond medium rare will render some of the marbling from the cut, leaving it in the pan rather than in the meat. What if i like my steak “black and blue,” or extremely rare? You’ll need to get the internal temperature up to approximately 130° to fully melt those spectacular fat reserves, and that’s when the steak will release that buttery richness. The flavor will still be there, but the juiciness won’t be at its peak. Do i need to cook the steaks individually? 7X beef is incredibly consistent, both in the size of the cuts and the texture of the meat. That means that as long as you’re cooking the same cut (and you’re using a high-quality pan), all of the steaks will cook in the same amount of time. Can i grill 7x beef? The marbling in 7X liquefies quickly, and flare-ups are likely when grilling. If you’re a stickler for grill marks, give the cuts a quick sear on each side and then finish them in a 400° oven. Better yet, invest in a cast-iron grill pan with ridges. Why should i finish these in the oven? Because the direct flame of grilling, coupled with the marbling content of 7X Beef, means that the outside may be overcooked before the inside is done. Grilling experts may move the patties to a cooler part of the grill to finish the cooking, but that is an advanced grilling maneuver, and may lead to the next question. What if i’d rather not break out the grill, but still want a burger? In a well ventilated kitchen (because there will be some smoke), simply sear a patty like you would a steak, at 4 minutes a side, and then place in a 400° oven to bring the internal temperature into the desired range.